Researchers have discovered that the destructive tsunami generated by the March 2011 Tōhoku-Oki earthquake was a long-hypothesized “merging tsunami” that doubled in intensity over rugged ocean ridges, amplifying its destructive power before reaching shore. 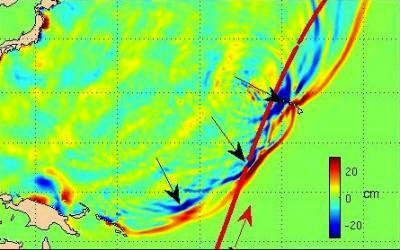 Satellites captured not just one wave front that day, but at least two, which merged to form a single double-high wave far out at sea — one capable of traveling long distances without losing its power. Ocean ridges and undersea mountain chains pushed the waves together, but only along certain directions from the tsunami’s origin. The discovery helps explain how tsunamis can cross ocean basins to cause massive destruction at some locations while leaving others unscathed, and raises hope that scientists may be able to improve tsunami forecasts. At a news conference Dec. 5 at the American Geophysical Union meeting in San Francisco, Y. Tony Song, a research scientist at NASA’s Jet Propulsion Laboratory (JPL); and C.K. Shum, professor and Distinguished University Scholar in the Division of Geodetic Science, School of Earth Sciences at Ohio State University, discussed the satellite data and simulations that enabled them to piece the story together. The NASA/Centre National d’Etudes Spaciales Jason-1 satellite passed over the tsunami on March 11, as did two other satellites: the NASA/European Jason-2 and the European Space Agency’s EnviSAT. All three carry a radar altimeter, which measures sea level changes to an accuracy of a few centimeters. Each satellite crossed the tsunami at a different location. Jason-2 and EnviSAT measured wave heights of 20 cm (8 inches) and 30 cm (12 inches), respectively. But as Jason-1 passed over the undersea Mid-Pacific Mountains to the east, it captured a wave front measuring 70 cm (28 inches). The researchers conjectured ridges and undersea mountain chains on the ocean floor deflected parts of the initial tsunami wave away from each other to form independent jets shooting off in different directions, each with its own wave front. The sea floor topography nudges tsunami waves in varying directions and can make a tsunami’s destruction appear random. For that reason, hazard maps that try to predict where tsunamis will strike rely on sub-sea topography. Previously, these maps only considered topography near a particular shoreline. This study suggests scientists may be able to create maps that take into account all undersea topography, even sub-sea ridges and mountains far from shore. Song and his team were able to verify the satellite data through model simulations based on independent data, including the GPS data from Japan and buoy data from the National Oceanic and Atmospheric Administration’s Deep-ocean Assessment and Reporting of Tsunamis program. Song and Shum’s collaborators include Ichiro Fukumori, an oceanographer and supervisor in JPL’s Ocean Circulation Group; and Yuchan Yi, a research scientist in the Division of Geodetic Science, School of Earth Sciences at Ohio State. This research was supported by NASA.